Going to school in Sydney showed me there is a lot of misinformation about Australian Agriculture in the general public so I created this blog to give an insight into the real world of farming and the real lives of farmers, the ups, the downs and every thing in between. This isn’t about veggie patch and a couple of pet sheep, this is about real world farming with broad acre cropping and life on a cattle station. 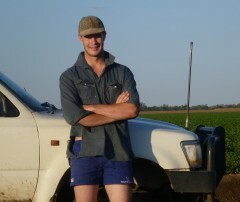 This blog aims to provide accurate information on Australian farming practices as well as showing my experience’s as a young Australian farmer. Hey Martin! Very excited to see what you get up to. Your blog is great and I can’t wait to see more. Fantastic Martin. More strength to your arm. Every citizen needs 1st Graded food, but manufactures, suppliers and exporters always have 2nd grade and misbranded products out of the their products. Who needs those grades, the answer is the solution. What is the diameter of the pure round bales from the John Derre 77 picker in Australia?